For many years I struggled to grow and flower oncidiums but in recent years I seem to have mastered the art and most of my mature plants now flower each autumn. 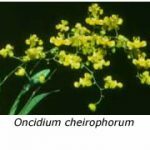 I’m referring here to the most commonly grown types, those hybrids referred to as “crispum” types that are bred from Oncidium crispum and the closely related O. marshallianum, O. gardneri, O. forbesii and O. enderianum (all members of section Crispa). While I grow them successfully in a ‘cosy’ shade house with a solid roof, other growers manage them quite well under shade cloth alone. Their yellow and brown flowers, carried on long, branched inflorescences, are mostly produced in autumn, when they last well for several weeks. Most of my early problems in growing these colourful ‘dancing ladies’ stemmed from loss of roots, caused by a variety of cultural faults. Over-watering in winter, poorly draining potting mixes and attack by garlic snails and caterpillars were the main problems. But finding a spot in the shade house where they receive good ventilation and an acceptable level of light is also important. 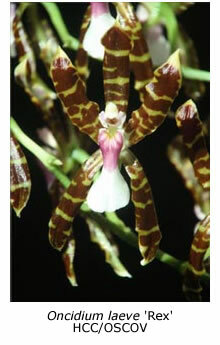 In nature the species of the Crispa section of Oncidium are found mainly in the mountain ranges that run parallel and close to the east coast of Brazil. The summers are warm and wet but the winters are cool and dry. The plants receive good light in winter because many of the forest trees on which they grow are deciduous. It’s therefore important to keep oncidiums bred from these species fairly dry during winter and to provide them with good light. During summer they need some shading (50% shade cloth seems about right for Melbourne) and frequent watering and fertilising, always taking care to allow the potting medium to dry out before watering again. Most important of all is to provide excellent drainage – use large pieces of pine bark or tree fern chunks as the potting medium, and for preference use hanging baskets or basket pots. Many of the roots will travel right through the potting medium and hang freely but this does no harm and enables one to see at a glance whether the plant is in growth or not. If the root tips are active (green), then the plant should be watered and fertilised frequently (with the above-mentioned proviso that the mix should become dry before watering the plant again). If the root tips have sealed over (white), then reduce watering to once a week or even less often. 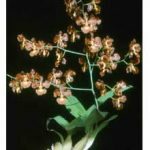 Alternatively, grow your oncidiums mounted on rough tree branches or tree fern slabs but in this case you will need to pay particular attention to watering in summer, because mounted plants dry out so quickly in hot, windy weather. It’s important to check the conditions of the roots regularly. 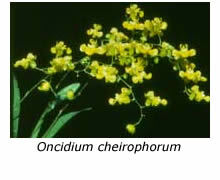 Oncidium roots seem to be particularly attractive to several different pests, especially snails and caterpillars. Once the active tips have been eaten or otherwise damaged, it seems to take ages before the roots grow new tips and most of the all-too-short growing season will have been lost. 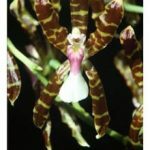 Dust or spray your oncidiums as soon as these pests are seen anywhere in your collection. 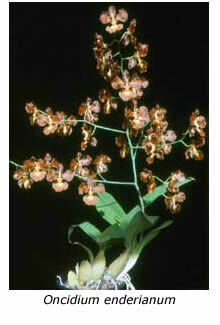 Another of my earlier cultural faults was to allow my oncidium seedlings to flower before the plants had matured. Some plants flower when they are quite small and it is all too tempting to wait until most or all of their buds are open, so that the plant can be exhibited as a first flowering seedling. This is a mistake because the juvenile plant puts all its energy into flowering, rather than into growth. Either it takes another two or three years before flowering again or else it dies! Now I seem to have found the ‘knack’, I wonder why I previously found growing oncidiums so difficult. My main advice to those who find them difficult is to pay them the respect that they deserve. If the potting mix appears to be deteriorating, repot them as soon as they begin active growth, because it will take them several seasons to recover from major root loss caused by a poorly draining mix. Keep a constant watch for insect pests and water and fertilise your plants only when they are actually in growth.